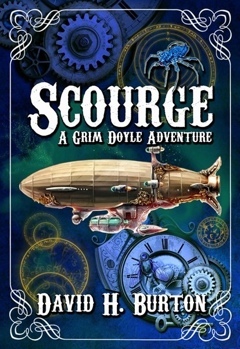 Scourge is the first book in an enjoyable Steampunk/Fantasy series. The story starts out slow as the main character, Grimwald Doyle, introduces his siblings, his two Dads and what a day is like in the Doyle house. Life is unpredictable and even more so, when one afternoon The Unseen arrive and force Grim and his family to flee to another land where things aren't always as they seem. Although, this book is geared towards 9-12 year olds, I feel the younger ones may find it difficult to understand at times. There is some violence and a few characters are killed, only one of the characters deaths is touched upon, the others are mentioned in passing. The story is filled with suspense and mystery as Grim, his 5 siblings and Treena, the daughter of the Resistance group, take on an orphanage, a duke, gargoyles, banshees and more to put back in place what once was stolen. Follow them as each of the children come to realize that they have certain abilities not heard of since the DJinn and The Mystics went into hiding. With their "magical" goggles, gidgets and gadgets, the 7 children work together to unravel the mysteries around them and come one step closer to their own destinies. Grim believes life in his house isn't quite "normal" and the day he finds the stones, his family is whisked away into the fantastical Steampunk world of Verne. Grim and his siblings must hide from their evil Uncle until their two Dads can right whatever wrongs have come upon them. The children are hidden in an orphanage and while they are there, they learn about the DJinn, Mystics, and the incredible power of Absinth as they try to discover who is trying to kill them with The Scourge.